The Santa Barbara Blanket is the industry standard in heavy, durable cotton blankets. The thick waffle weave pattern combined with the durable cotton yarn results in long-lasting, warm, and cozy hospitality blankets at a low wholesale price with free shipping. 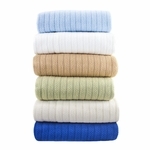 These heavy duty cotton blankets are available in your choice of 4 great colors: White, Ivory, Camel, and Gray. 100% Combed Cotton Yarns - Soft, Durable, Warm. Tightly woven pattern - reduces snags and thread pulls.